I met Tom Sawyer at the age of 8. One summer we stopped in Hannibal, Missouri, where I was exposed to all the settings for the story, including the (still) frightening sojourn into Injun Joe’s Cave. I was also gifted with a beautiful edition of the book (the kind which comes in it’s own slide-in box), complete with illustrations by Norman Rockwell. I couldn’t put it down. I still have it. Partially autobiographical, not nearly as complex as Huckleberry Finn, its simple scenes are, just like Rockwell’s paintings, a look back at a time when boys spent lazy afternoons in imaginary worlds. Unburdened by supervising adults, they took risks, dreamed, and grew. It is perhaps Mark Twain’s most earnest, genuine tale. And now, at the Sierra Madre Playhouse, a lovely adaptation by Laura Eason brings the simple essence of the story to lively life. This charming production uses adult actors to create the world of these children, and in the spirit of stage magic, it works. One does not end up talking about how cute the kids are, one can just absorb the story. Under the direction of Aaron Lyons, and accompanied by a gentle bluegrass violin (Jennifer Zahlit), the episodic nature of this story blends into a cohesive whole. Mike Rosenbaum makes a somewhat scrawny, enthusiastic Tom, dreaming of pirates and midnight frights, but shocked when his adventures develop a tinge of reality. 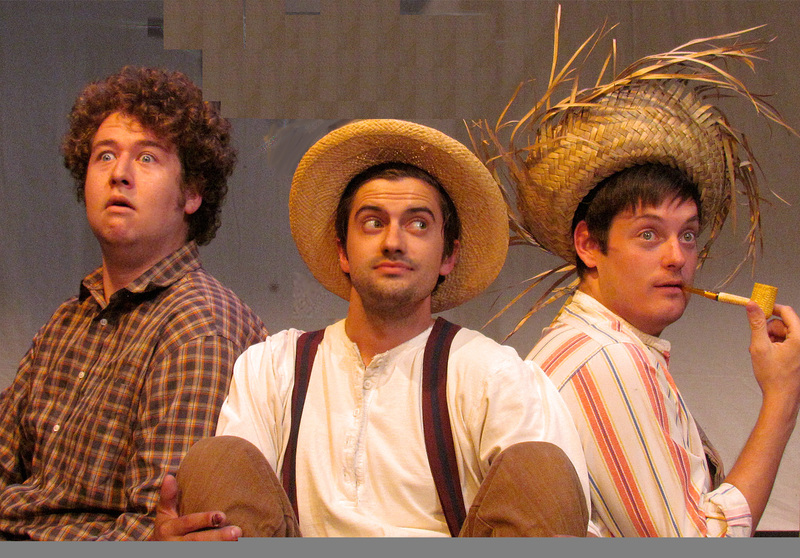 Jason Thomas all but steals the show as the practical, independent Huckleberry Finn, confident and sure of his own road. Sierra Campbell-Unsoeld creates a charmingly innocent Becky Thatcher. Cameron Miller makes the perfect goody-two-shoes as Tom’s rather sanctimonious brother Sid. Hank Doughan creates several compelling characters, including Tom and Huck’s hesitantly willing compatriot Joe, and a straightforward, intense defense attorney. Brandon Karrer creates, among other things, a pretty scary Injun Joe, and an intimidating school master. Other performers who play more than one member of Tom’s world apiece include Katie Hotchkiss and Jeff Doba, whose work is equally satisfying. The tale is told on a minimalist set of levels, occasional boxes and a few surprise hidden bits symbolic of the country town in which they live. Under Lyons’ direction, these easily become caves, riverbanks, country kitchens and churches. The piece flows quickly from bit to bit, and continues the atmosphere of the book, which takes everything which happens at face value – a story told without judgement, from the perspective of the boys central to it. In short, the show does Twain proud. It is clever and simple in many ways, but never talks down to its audience or looks down on its characters. Creating that sense of innocence is tougher than it looks, but here it works beautifully. Indeed, if you or your children have never read or heard the story, this is an absolutely lovely introduction: quiet and connected, and in its own way a compelling window on a world of childhood before electronics separated kids from each others’ imaginations. So, go if you can. One small warning (and a nice one) is that this show has become a recommended favorite in L.A. Weekly. Tickets may move fast.